A carefully stated cri de guerre against “the current cult of leadership” that characterizes corporate culture—and leads to extraordinary paychecks. Why is it that the head of an American corporation should be paid millions—sometimes tens of millions—more per year than an entry-level worker there? Ask a member of the board, writes legal scholar Dorff (Southwestern Law School), and you’re likely to be told that chief executive compensation is so high because that leader is indispensable to the success of the company. In the case of GE’s Jack Welch, that may have been so: After all, he increased the company’s worth nearly 30 times over in his tenure. But what of those executives who preside over near-catastrophic loss of worth and market share, layoffs and scandal, yet receive their stock payouts and fat paychecks regardless? The theories underlying the supposed indispensability of the CEO, writes Dorff, lack “strong empirical support.” Instead, in many cases, CEOs are rewarded disproportionately simply because other CEOs are rewarded disproportionately. A corporate culture has developed in which it’s assumed that this vicious circle is the natural order of things; it’s not corruption or cronyism that makes this so, but a simple misreading of the world. 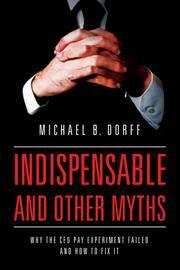 Dorff proposes that rather less quantifiable rewards be encouraged, among them “harnessing reputational desires, creating motivational cultures, and cultivating internal drives.” Understandably, many bosses will prefer the money, but Dorff’s insistence that corporations need less-expensive leadership seems intuitively right. If nothing else, the shift in accounting methods that he describes favors the reforms he suggests, including perhaps adding more restricted stock to compensation packages instead of options, which “reduces the lottery factor in CEO pay. A provocative thesis couched in measured, scholarly language. Watch the editorial pages of Bloomberg News and the Wall Street Journal to see whether it catches on.